With 97 stops pegged, the tour needs the best possible opening acts to capture the energy of the audience and keep the momentum going – a daunting task to some, but also a rite of passage. 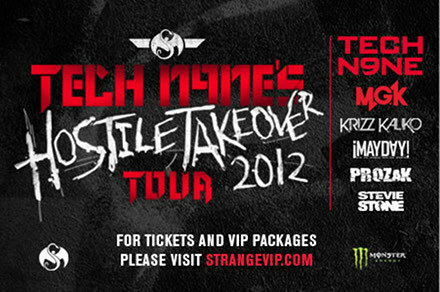 Strange Music caught up with some of the upcoming opening acts on the Hostile Takeover 2012 Tour, here is what they had to say. Opening up for the 5/14 show at the Cheyenne Ice and Events Center in Cheyenne, Wyoming is Y-O. Tell us a little bit about yourself – how long you’ve been in the game, your inspirations, and your aspirations. As far as being in the game I have been writing and recording music since 2008….but I grew up as a child of music. Obviously coming from Wyoming I was introduced to the country music genre at an early age. But my parents choices in music were the reasons why I gained such a diverse musical background. My mother always played and listened to disco and funk music like Earth, Wind, and Fire and The Ohio Players. My father, on the other hand, was a die hard rock and roll fan and so I also grew up with a big rock influence with artists like KISS and AC/DC. When I was about 6-years-old I came across the Sugar Hill Gang in my parents’ music. I heard the song “Rappers Delight” by Sugar Hill Gang and from then on hip-hop was like an obsession. I was quickly into artists like Run DMC and Kurtis Blow thanks to all my parents’ albums. From then on I just grew up listening to everything hip-hop I could get my hands on. It was hard to do living thirty miles from the nearest city, on a farm, as a kid, not to mention coming from a place like Wyoming where hip-hop is almost non-existent. I was always memorizing songs and rapping them to myself, but in a small rural town and school I really had no friends that had the same dreams as me. So I really had no outlet or way to get my sound out. It wasn’t until I got to college when I met Glenn Springthorpe aka G-Spring that I started writing and recording. He had some beats and a little mic setup and so I wrote my first song in 2008. From then on I had just found what I was meant to do in life and so I just never stopped. I never even thought that anyone would ever know a single lyric to my songs, and now I’m playing shows and people are out in the crowd singing along. My number one inspiration would have to be Kanye West for the way he came up and his genius. Also artists like Biggie, Sugar Hill Gang, Eminem, and Ludacris…all the way to new young artists like Wiz Khalifa, Chris Webby, and MGK who really sent a message out that represents following your dreams no matter who you are or what you want to do. That is also what I represent, because as you can see rappers in Wyoming are few and far between. So my aspirations are to simply just let people hear my music…maybe it influences or speaks to people in a great way, and maybe it doesn’t. Either way I just want everyone to know that I’m here and I do what I do coming from the place I come from. It is possible to be anything you want no matter who you are or what you represent. Drive and just being you is all anyone needs. I guess a world tour and millions of fans wouldn’t be too bad either (laughs). How does it feel to be part of a legendary, world-record setting hip-hop tour? When I got the call and found out I was going to open up for this show my mind was blown! Not only is it a huge show, but it’s Tech N9ne! Then I found out about MGK coming and I was floored even more. And the fact that this is biggest hip-hop tour ever – I can’t even put it into words. I still can’t believe that I am going to have my time on that stage, with those artists, and on this tour. It’s really a dream come true in itself and its a great honor and a once in a lifetime opportunity. How long have you been down with Strange Music? I have alway been a big fan of Tech’s music ever since the first time I heard one of his songs. His style is one of a kind and few can be compared. I was always bumping “Caribou Lou” when I was partying and probably my most favorite song of his is “Red Nose” for its message and just the rawness of Tech N9ne. He has definitely been a big part of my hip-hop and rap influence along the way. I always hear that Tech’s shows are amazing and one of the best shows to ever see. I myself have never had the privilege to see one of his shows…so I guess it’s fitting that my first Tech show is one that I am performing in! What can the Technicians expect out of your show? Technicians that come to the show are obvously coming to see Tech N9ne, and I wouldn’t say that my style of music is the same style that Strange Music does. But what they can expect is a raw, upbeat, live hip-hop performace with great lyricism that will definitely keep them entertained. I guess you could say that I use my life experiences and the way I was brought up and mix it with music – it’s great hip-hop coming from a very unexpected place. Anything you would like to say to the Technicians coming out to the show? To all the Technicians coming out to the show I just want to say that you are some of most loyal and best fans out there, if not the most loyal and best. It is an honor to play for you all and open up for some of your most beloved artists in Strange Music. I will do what I always do and what I love to do and that is play hip-hop music and put on killer shows. I can’t wait to see you all out there and hopefully I can show you a side of hip-hop that is exciting and opens up the show in the best way possible! Like Y-O on Facebook and be sure to catch him open on the 5/14 show of the Hostile Takeover Tour.